Derby Days in the Village of Lewisburg kicks off the festival season in Preble County, this coming Thursday-Saturday, Aug. 16-18. 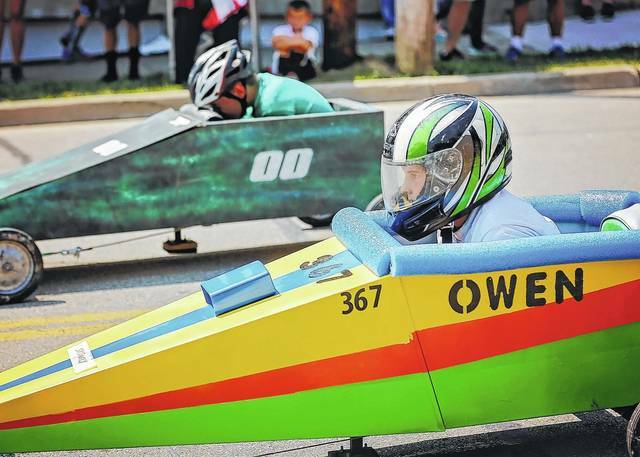 LEWISBURG — Lewisburg’s Derby Days will kick off late summer and fall festival fun in Preble County this Thursday, Aug. 16. The three days of family fun begins at 6 p.m. on Thursday with the annual Baby Beauty Contest, and continues with a kiddie tractor pull at 8 p.m. and the yearly “egg drop” contest at 9 p.m. at the firehouse. The egg drop is for children of all ages in three categories: 7-11, 12-16 and 17-up. Friday, Aug. 17, brings a full chicken dinner at 4:30 p.m. at Trinity Lutheran Church, pork chops from the Lions Club beginning at 5 p.m., and more. The Derby Queen will be crowned at 7 p.m., and the Flat Out band will provide live music for a street dance from 9-11:30 p.m. Derby racers will draw for their spots at 10 p.m. at the firehouse. For the third year, there will be demonstrations at the historic Smith’s Blacksmith shop, from 5-8 p.m. on Friday and Saturday. The shop is located behind the Ace Hardware store. Motorcycle Bike Night also begins at 5 p.m. on Friday, just south of the firehouse on Ohio 503. Lasting until 10 p.m., rain or shine, Bike Night includes several contests and plaques for the winning bikes. There will be music, food, and a beer garden, as well as a 50/50 cash drawing, and rides and games for children. Rides and games will be operating from 6-10 p.m. Thursday, 4-10 p.m. Friday and noon-10 p.m. on Saturday, Aug. 18. Breakfast will be served at the firehouse by VFW members beginning at 7 a.m. Saturday, and there will be a bake sale sponsored by the UCC at the bank at 9 a.m. The pet contest will also begin at 9 a.m., with registration prior to the event. A Derby Day Dash 5K race will begin at 8 a.m., with registration packet pick-up at 7 a.m. the United Methodist Church on U.S. 40. The Derby Race itself will begin at noon on Saturday. The 26th annual cruise-in will begin at 5 p.m. on Saturday, and includes awards for best of show, and free dash plaques. All cars and trucks, including rods, antiques, classics, customs and corvettes are welcome. There will be door prizes and more. Delta Theta Tau will serve a full chicken dinner beginning at noon on Saturday, and from 5-10 p.m. there will be a street dance featuring music by Stacy Crabtree. Derby Days festivities will close with a large fireworks display at 10 p.m.
Commerce Street from Clay to Harrison Streets will be closed Thursday and Friday at 5 p.m., and all day on Saturday. Derby Days also includes Lewisburg’s community-wide garage sales. Bicentennial merchandise will be available for purchase at the Bicentennial Store. https://www.registerherald.com/wp-content/uploads/sites/41/2018/08/web1_DERBY-DAYS-10.jpgDerby Days in the Village of Lewisburg kicks off the festival season in Preble County, this coming Thursday-Saturday, Aug. 16-18.